So I went with this recipe that only called for 2 cups of rhubarb, which was precisely what I had. I do like breakfast/snacking cakes, and this one came together quickly and baked before I was starving on a Sunday morning. The color of my final cake is more golden brown than the blogger's original, but I did have to make a few changes to the recipe: I used milk instead of half-n-half, and once I started measuring things realized I only had 1/2 cup of all-purpose flour! So I used up the gluten-free flour mixture that I bought for my sister's visit, and filled in the gaps with spelt flour. I loved the texture of the cake, and the lovely flavor. I would have liked it even better with some hazelnuts or pecans. And my rhubarb doesn't look as pretty and pink after baking as the original blogger's - so even if you can't see rhubarb in there, it is! And it's delicious! Set oven to 350F Lightly butter a 9x9 square baking pan. I like to line the pan with parchment paper with overhanging ends so I can easily lift out the cooled cake for cutting. That's optional. Stir the lemon juice into the half and half and set aside. Cream the soft butter and sugar in a stand mixer, or with electric beaters, until fluffy and pale yellow. Beat in the egg and vanilla, scraping down the bowl as necessary. Take 1 Tbsp of the flour to the rhubarb and toss well. Whisk together the remaining flour, baking powder, and salt. Add half of the flour mixture to the bowl and blend in. Add all of the half and half, and blend in. Finally add the rest of the flour and blend just until combined, don't over mix. Fold in the rhubarb. Note: the batter is on the thick side. Let the cake cool slightly before cutting. So, what extraordinary thing are you bringing on Monday? Please make another Pavlova! My bday is this Friday and I would love to have a piece on Monday!! How could I ignore a birthday request? 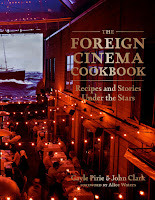 I had marked a recipe in The Foreign Cinema Cookbook: Recipes and Stories Under the Stars by Gayle Pirie and John Clark for a pavlova that used spring fruits, so once I checked that she was okay with rhubarb, I knew I'd make this recipe. The recipe in the cookbook ends up making 6 individual-sized pavlovas, but I wanted to make one giant one, not being able to predict how many people would be there, but knowing it would be more than six. 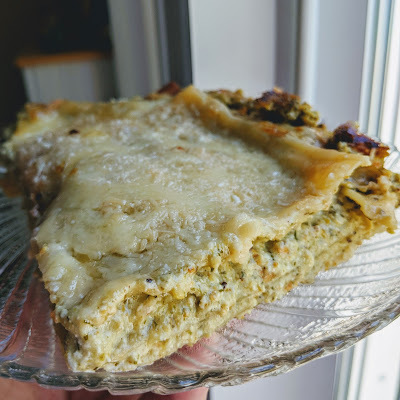 So I found a recipe with what looked like a scaled up recipe with the same ratios, just to make sure it would work, with one stabilizing ingredient (I'll link to it; the recipe that I'm including is from the cookbook itself.) I used the fruit methods from the cookbook recipe exactly, except I didn't have time to go find rosewater and left that out. I think this is how cookbooks are used, though, where you start with the recipe and adapt to make it work for your available ingredients and who you are making it for. To make the meringue: Position a rack in the center of the oven and preheat the oven to 200 F (90 C). Line a rimmed baking sheet with parchment paper. Fill a medium saucepan with enough water to reach about one-third of the way up and bring it to a boil over high heat. Lower the heat so that the water is just barely simmering. In a medium heatproof bowl large enough to rest on the edge of the pan of simmering water without touching the water, whisk the egg whites, sugar, and salt. Slit open the vanilla bean lengthwise and scrape the seeds into the bowl. Drop in the pod as well. Set the bowl over the pot and gently whisk the egg white mixture until the sugar completely dissolves and the mixture is hot (a thermometer should read 150 F/ 66 C). The liquid will look clear with a little bit of foam on top. Remove the bowl from the pan and transfer the egg white mixture to a clean bowl. Discard the vanilla pod. Beat the mixture with a handheld electric mixer on medium-high speed until it doubles in volume and stiff peaks form, 7-8 minutes. You should see no unincorporated liquid in the bottom of the bowl. Use a 3/4 cup (60-ml) measure to dollop the meringue onto the prepared baking sheet in 6 mounds with 2 inches (5 cm) all around them. Use the back of a spoon to make a well in the center of each. Bake until the meringues are dry on the outside and soft in the center, about 90 minutes. Transfer the pan to a wire rack to cool completely, at least 30 minutes. To make the coulis: Hull and roughly chop the strawberries and put them in a medium saucepan. Add the sugar, lemon juice, salt, and 1/4 cup (60 ml) water. Cook over low heat, stirring occasionally with a wooden spoon, until the strawberries are soft and the liquid is syrupy, about 10 minutes. Let cool slightly, then transfer the strawberries and syrup to a food processor fitted with a metal blade and process until smooth. Strain the berries through a fine-mesh strainer (discard the solids) and let cool completely. To prepare the rhubarb: Line a plate with paper towels. In a medium saucepan, combine the sugar, rosewater, salt, and 4 cups (960 ml) water. Cook over low heat, stirring occasionally, until the sugar dissolves and the syrup comes to a simmer, about 5 minutes. Add the rhubarb and return to a simmer until it is just barely tender, about 30 seconds. Remove from the heat. Pour the mixture through a fine mesh strainer; discard the liquid. Scatter the rhubarb onto the lined plate to cool. Pour 1/4 cup (60 ml) of the strawberry coulis into 6 shallow individual serving bowls and set a meringue on top of each. Center a heaping spoonful of rhubarb over each of the meringues, letting it cascade over the sides. Dollop each pavlova with whipped cream and serve immediately. Make ahead: Although this dessert has several components, all can be made in advance and assembled to order. Refrigerate the strawberry coulis and rhubarb in separate airtight containers up to 1 day ahead. Store the baked meringue in an airtight container at room temperature for up to 5 days. Notes from JennyBakes: I substituted this classic pavlova recipe, which has a lovely marshmallow texture on the inside if prepared correctly. 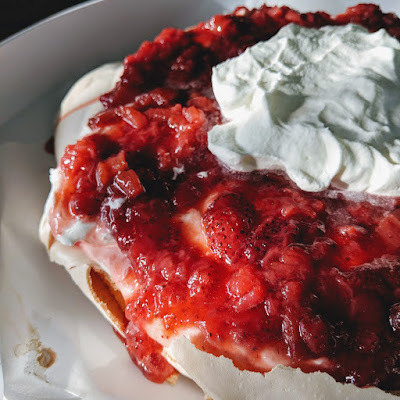 I made the whipped cream, rhubarb, and coulis the night before, then made the pavlova the morning of book club, allowing it to cool in the oven while I was at work. This worked okay but it did get quite a bit wider and flatter than it started, so I may not have beat the whites long enough! It still tasted good, still soft inside, and heck, it made it easier to share. This cookbook is brand new, and came out last week on May 15, 2018. 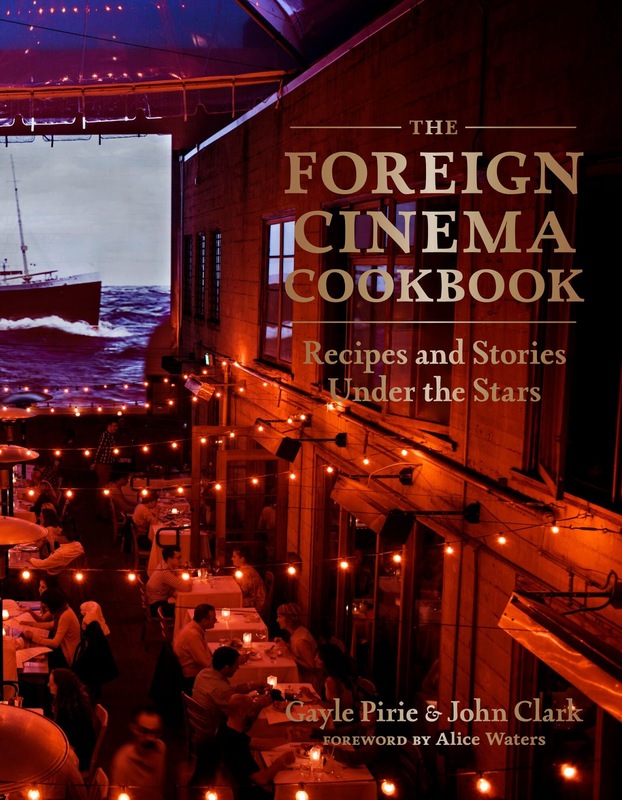 Since I wasn't familiar with the restaurant, I started out expecting recipes that matched with movies somehow. But apparently this is a well-loved San Francisco restaurant that has been around since 1999. Woe is me, for I live too far from the west coast. You can read more about the restaurant at its website. Until I had a reason to make the pavlova, I had my eye on a bunch of recipes that I am likely still to try (including some delicious sounding drink recipes based on homemade ingredients) - Potted Smoked Trout, Tomato Salad with Harissa Vinaigrette, Farro and Grilled Kale, Buttermilk Spoon Bread with Shiitakes/Corn/Scallions, Wild Greens Soft Polenta, Ginger Cake with Cardamom Creme Chantilly, and Champagne Omelet from the brunch section. 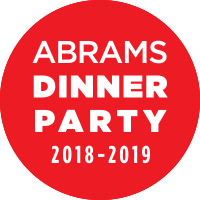 When I first perused First We Eat, one of the cookbooks sent to me as part of the ABRAMS Dinner Party, I was enamored by its northwestern focus, as a former resident of the northwest. I also loved the seasonal sections, and had my eye on some of the rhubarb recipes in particular. When rhubarb proved hard to find, I dug my heels in until I could find some. One (new, I presume) worker at a local organic store told me that rhubarb season is August, but anyone who knows looks for it between April and June. Finally the produce guy at Publix, wearing a light pink shirt, said he had a big box in the back, and stopped what he was doing to package some up just for me, including washing and chopping it. This is not a paid advertisement for Publix, but seriously, does any grocery store even come close to their service level? 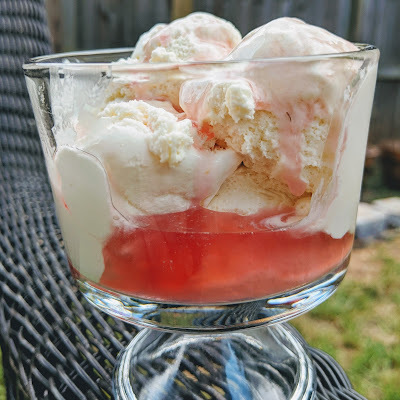 I marked several rhubarb recipes, but the one that moved to the forefront is this recipe for rhubarb-tarragon ice cream. I couldn't imagine the flavor combination. It took almost a week longer to make all the parts and to allow time for everything to chill properly, but I did it! In a very small saucepan, stir together the condensed milk and tarragon. Heat over low heat until hot but not boiling, stirring every minute. Remove from the heat and allow to rest at room temperature for 1 hour. Strain the infused condensed milk into a bowl, discarding the tarragon. In a medium saucepan, combine the rhubarb, sugar, star anise, and 1/2 cup (120 ml) water and bring to a boil over medium-high heat. Reduce the heat to low and simmer, stirring every 5 minutes, until the rhubarb has become pulpy and partially disintegrated, 20-025 minutes. Remove from the heat and allow to cool to room temperature. Strain the syrup through a mesh sieve into a bowl and discard the solids. You can double the syrup recipe, and serve half alongside of the ice cream for garnish. The syrup can be stored in an airtight container in the refrigerator for up to 1 month. In a medium bowl, whisk together the egg yolks and the rhubarb syrup until the mixture lightens in color, 3-5 minutes. Bring water in the bottom of a double boiler to a boil over medium heat. Reduce the heat to low. In the top of the double boiler, whisk together the infused condensed milk and the egg yolk mixture. Whisk until the mixture thickens enough to coat the back of a spoon, 10 to 12 minutes. Remove from the heat and allow to cool to room temperature. Cover and refrigerate for at least 4 hours or overnight. In the bowl of a stand mixer fitted with the whisk attachment, beat the cream on medium-high speed until it holds soft peaks. Cover and refrigerate. Fold the whipped cream into the chilled egg yolk mixture, then pour the mixture into an ice cream machine and churn according to the manufacturer's directions. Transfer the ice cream to an airtight freezer-safe container. Cover and freeze. Best if eaten within 6 months. I did make the double recipe of the syrup, as you can see in the photo. What a pretty pink color! I also have been adding some to sparkling water for a fizzy spring drink, since I didn't end up using all that much when serving the ice cream. If I know anything, it's that you have to really chill everything, so I did overnight for all of it. First We Eat: Good Food for Simple Gatherings from my Pacific Northwest Kitchen, is by Evan Kosmas Flores, and came out March 20, 2018. I also made the Fennel-Pistachio Pesto Lasagna, since it also had the tarragon and I had enough for both recipes. If you can't picture this flavor combination, well neither could I. It was amazing. Fresh and tasting of spring, and if I had not known what was in it I'm not certain I could have identified the flavors individually but they really did work nicely together. I'll post a picture of that at the end of this post. 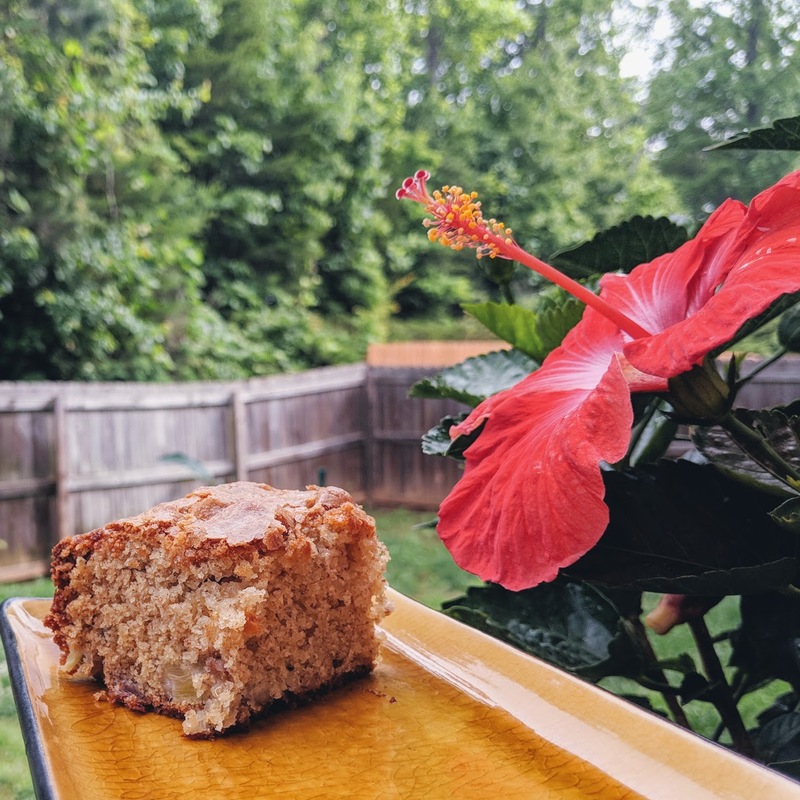 I have my eye on the Brown Butter Sprouted Grain cake that is made here with a rhubarb buttercream, but probably has endless flavor possibilities. I even went as far as purchasing the sprouted grain flour but have not made it yet. I also plan to make the Chai and Poppy Challah (but it seemed better for the fall), the Homemade Chai Latte, and perhaps I'll bring the recipe for Foraged Fir Tip Herbal Tea with me to Alaska.